Over the last month or so we have been trying with mixed success to bake our own bread, not in least through the encouragement of watching that Paul Hollywood bloke off the telly and this seemed like a really good opportunity to meet some other bakers, get a few tips, and talk about our trials and tribulations Plus it was a day out in the countryside and there was always the possibility of some cake or biscuits. 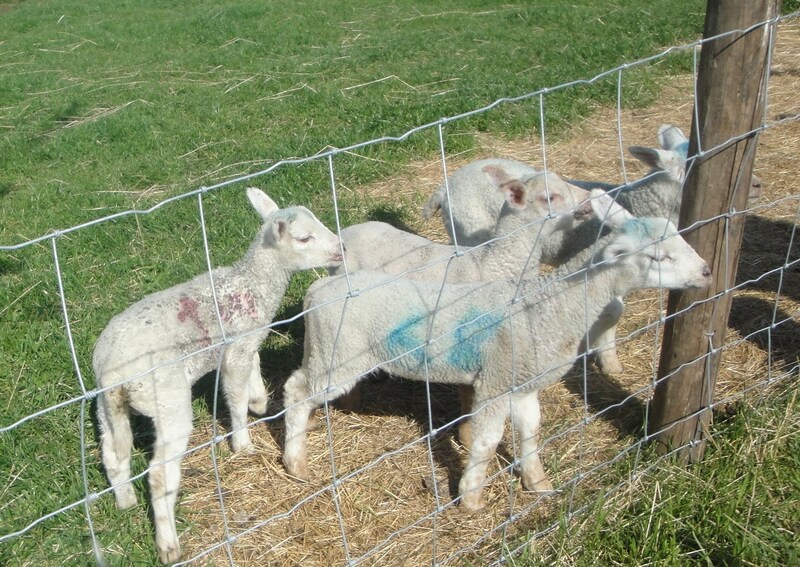 We arrived a bit early for the session so we had a look around the farm at the various animals before meeting up with David Rose who runs the Centre and Farm and he told us all about their activities with the Local school kids where they are teaching them all about where bread comes from with their “Seed to Sandwich Campaign“. 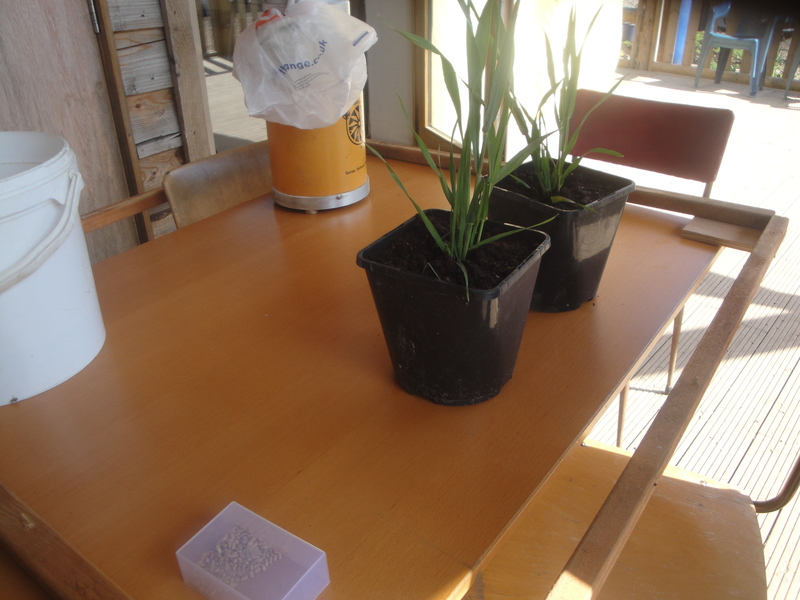 They get to grow their own wheat, then turn it into bread and ultimately made their own sandwiches by growing the other sandwich salad fillings as well. 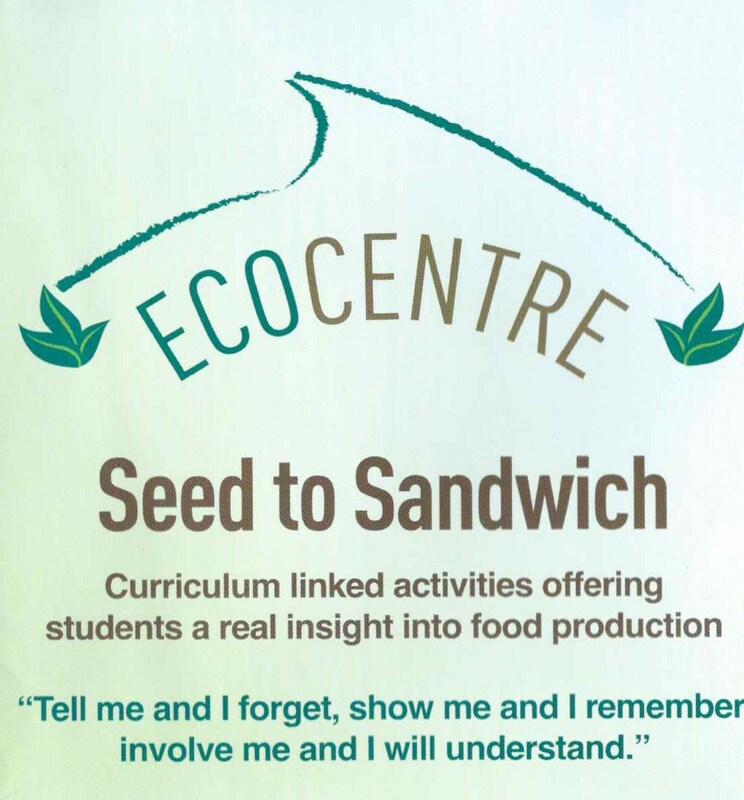 A great and quite commendable activity, I wish my school had done that, luckily we had an allotment when I grew up so I did not miss out totally. 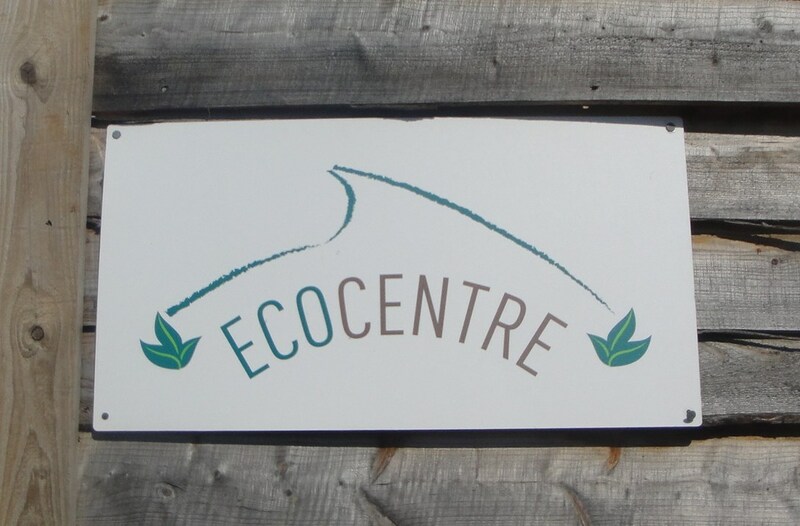 You can read a lot more about what is going on at the Ecocentre on their website. OK lets get down to talking about or rather baking some Bread. 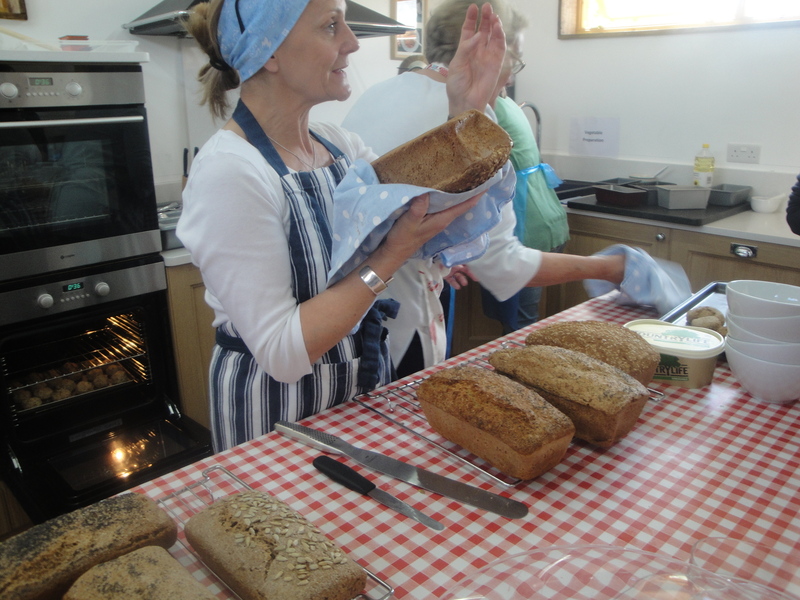 The bread making group at Home Farm is a Community Supported Baking Group and is supported by The Real Bread Campaign which ‘is the only national organisation in the UK championing Community Supported Baking’. 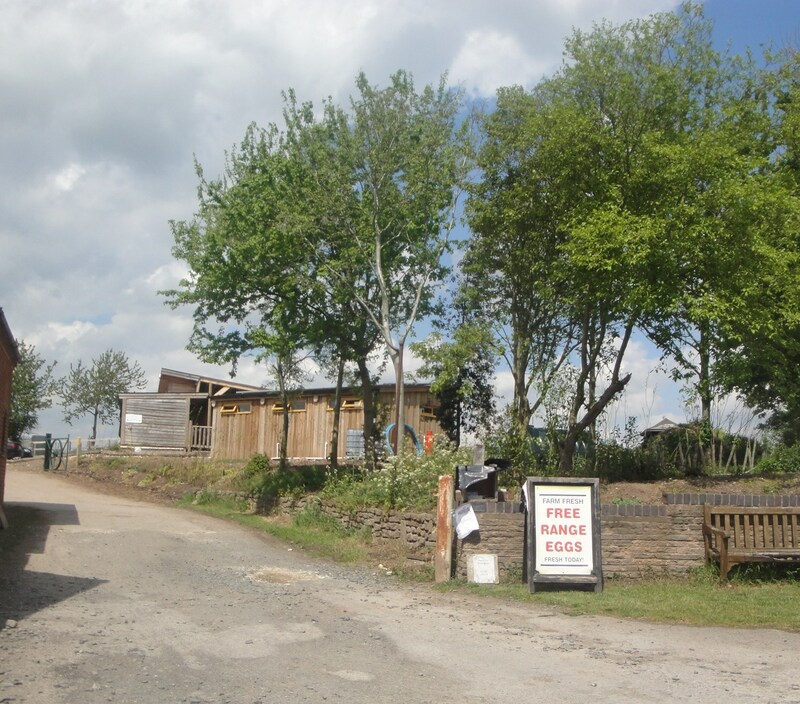 The Group at Screveton is being run by Gail Hooley and Simon Wilson who were there to guide us when we arrived. Gail was leading the session that we attended and as I chatted to her during the session I learnt that she had graduated from the Ballymaloe cooking school and I was secretly quite jealous as given the time and money I would like to have done similar. Anyhow I digress once again, you want to know about the breadmaking don’t you? 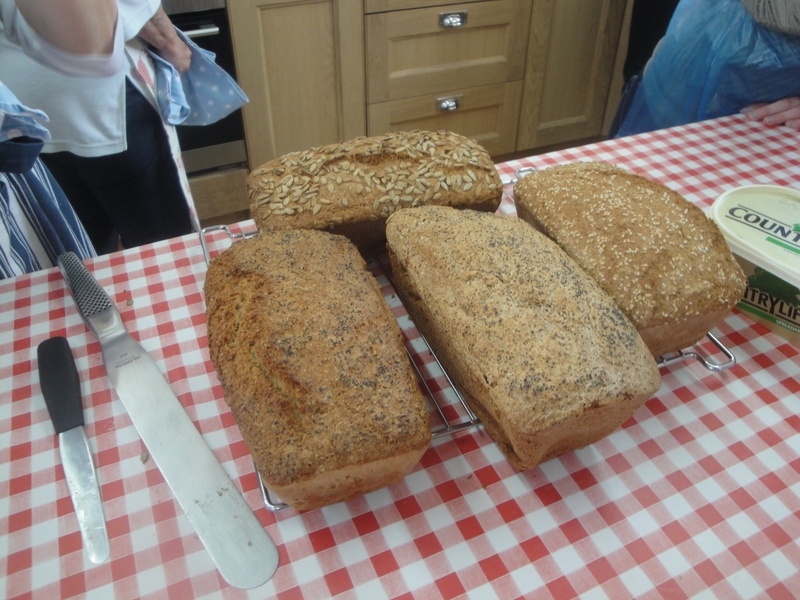 The purpose built kitchen and cookery classroom had been divided up into three stations at which you could learn to make breads using different levels of skill. 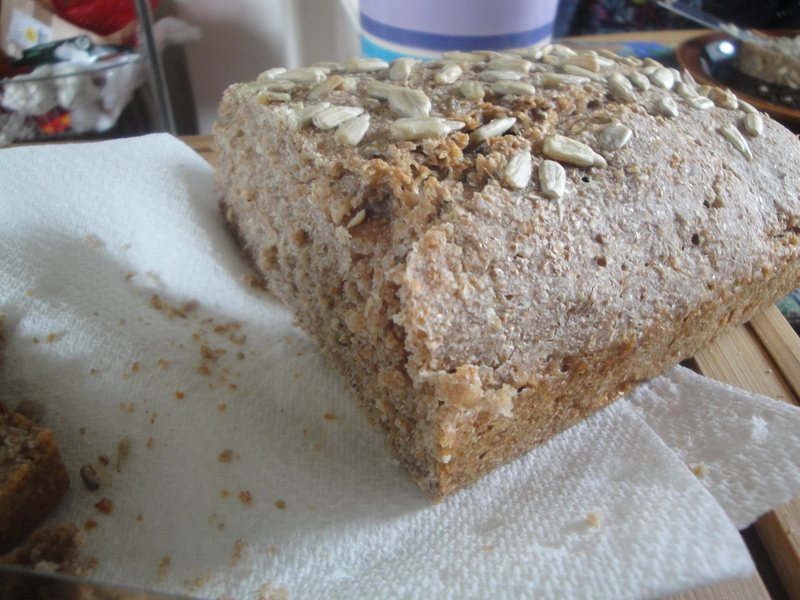 You could make soda bread chive scones, or you could make some ‘Grant Bread’, and at the last station you could go through the different stages of making a wholemeal loaf. There were about 10 people in the session I attended and most of them were already members of the community group and lets just say that they were a lively bunch but they welcomed us out of towners into their midst with open arms and floured hands. I started off with Celia learning how to make “Grant Bread” which is named after a lady called Doris Grant who developed a recipe for a ‘no-need-to-knead bread’ in the 1940s. When I say ‘developed’ the story or myth goes that making bread one day, Doris forgot to knead it. and when she tasted the loaf, she discovered it had a fair taste and decided never again to bother kneading her bread again. Not sure how true that was. Anyhow without boring you with details of the whole recipe I will just give you the high level view (you can google it if you want). It was a bit of a strange one, you take sieved flour, add fresh yeast, salt, water, and honey and stir it all together in a bowl. 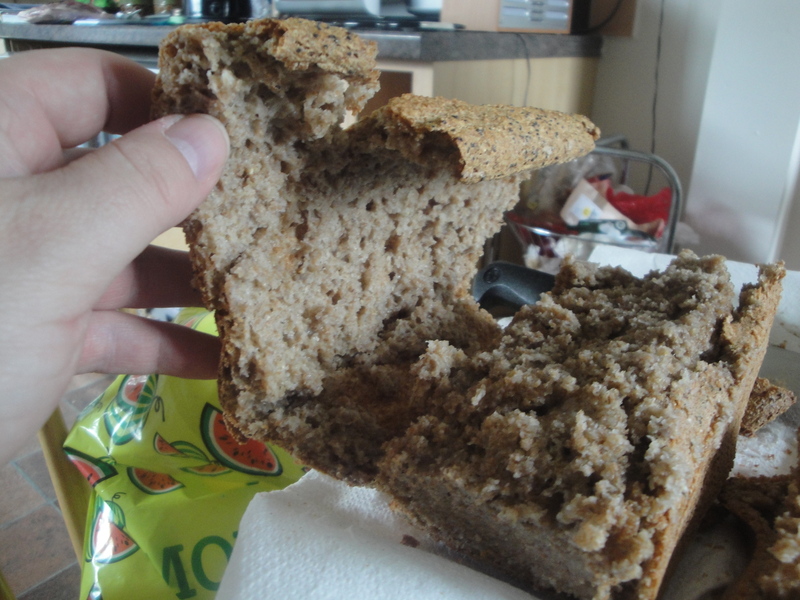 The mixture was so wet that it could not have kneaded it anyway if I had wanted to. Basically once mixed you just poured it into a greased loaf tin and left it to rise for about 20 minutes before baking. It rose quickly as we had used fresh yeast. 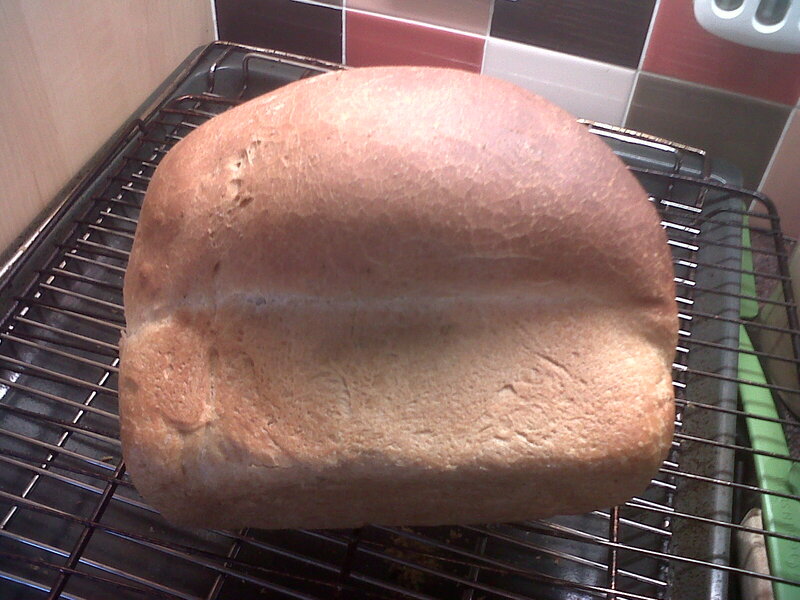 Mine did not quite work out as expected, the good thing about making the mistakes in the breadmaking group was that instead of just wondering where I had gone wrong I had Gail there to explain why my loaf was really a quite sad loaf indeed (she didn’t say that, she was quite kind). Basically it looked like a house brick with a dent because the loaf pan was not greased enough so the dough stuck to the pan and as it baked it could not expand evenly so it rose at an angle. The other problem was that the initial rise was too much so the mixture overflowed the pan and then when it rose the edges held on to the pan and as it rose a big air pocket was created in the top crust, the result being that the bread underneath didn’t cook properly and was still soggy. But as I commented at the time, “If I cannot eat it the birds in the garden will like it”, and you know what? that was true, they loved it and have been gobbling it up in great beakfuls all week. 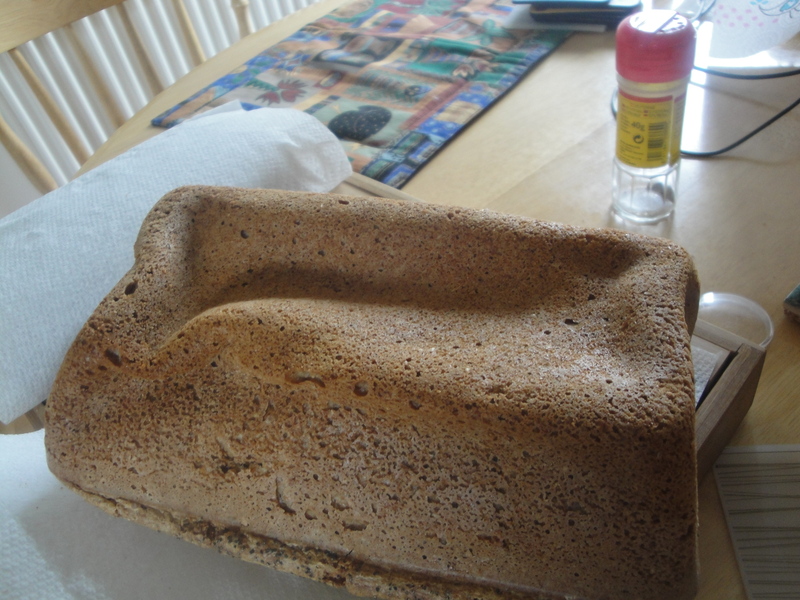 After I had been making the Grant Bread I joined into the group that was kneading the dough for the Wholemeal Loaf. They already had their loaves in the oven baking, but there was another session coming in the afternoon so we were making some dough ready for them. I am glad that I did this as I found out that I had not been kneading my own bread long enough and picked up some other good techniques. I am not sure that there was quite enough time in the session to let the first lot of bread rise enough before baking, but it tasted pretty good and we ate this at home with some nice cheese. 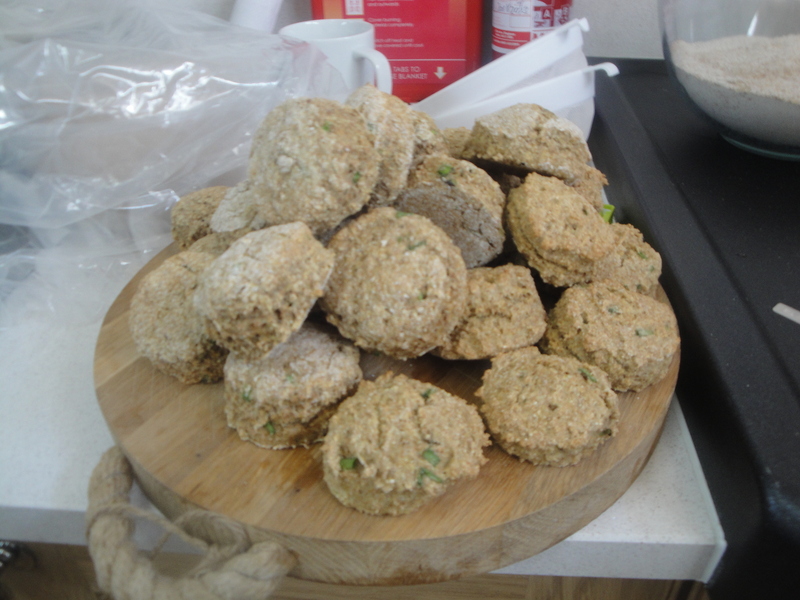 I did not have a go at the soda bread, but you can see their efforts were more successful than mine were. We all had a sample of their ‘offcuts’ with some butter while drinking the remnants of our tea and the chives were a nice addition to the scone. I would have been happier with a bit of cheese as well (that’s just me though being cheese mad). 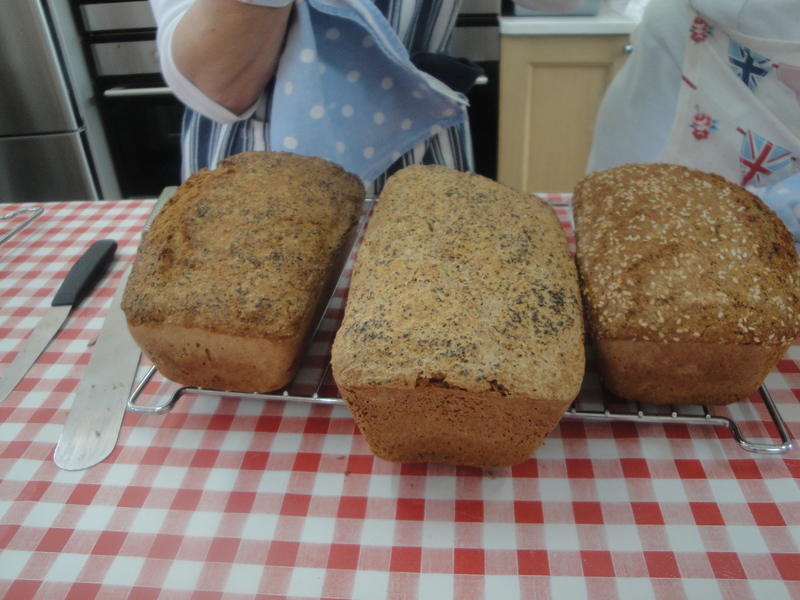 This community bread making was a lot of fun, I learnt a lot, and the group was very welcoming and I hope that I have the time to be able to go back for one of their fortnightly group sessions to try making some other types of bread. 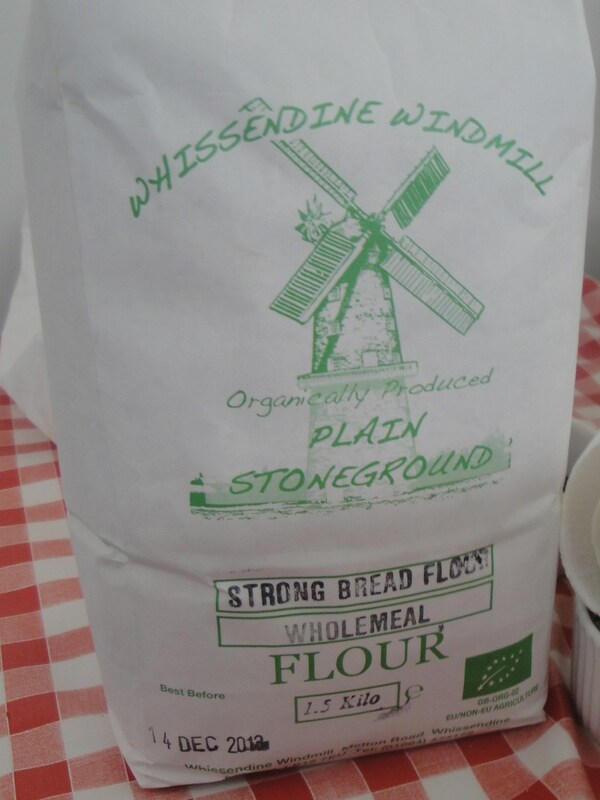 As a footnote we bought some fresh yeast and good flour at the group which came from the Whissendine Windmill in Oakham. Thanks to the extra kneading lessons and quality ingredients you can see that a much more successful load was baked. 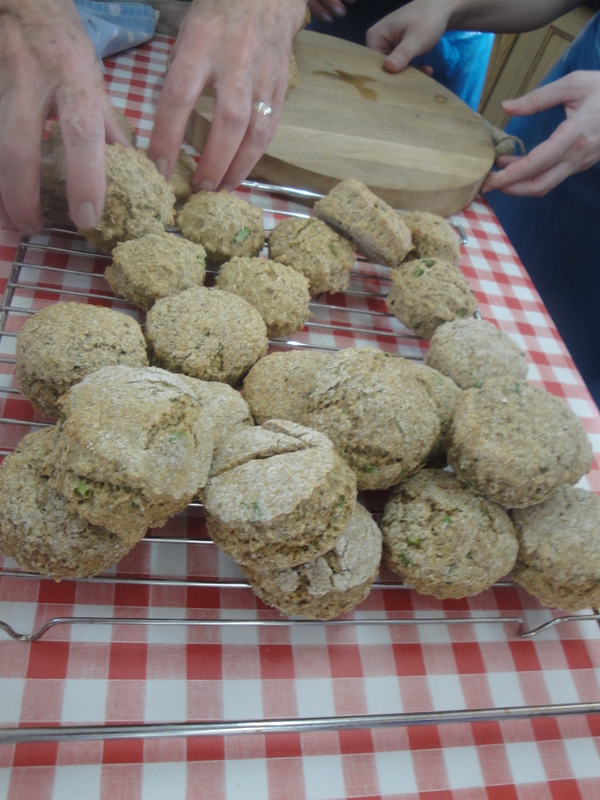 It was the best effort so far and just goes to show that we did learn something at our Community Baking session! 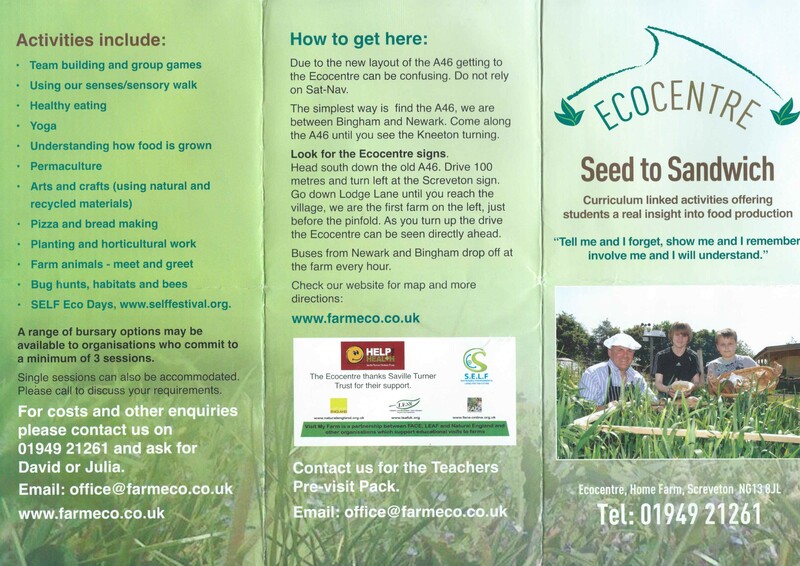 The Ecocentre is located at Home Farm, Lodge Lane, Screveton, NG13 8JL there are good directions on the leaflet scanned in below.